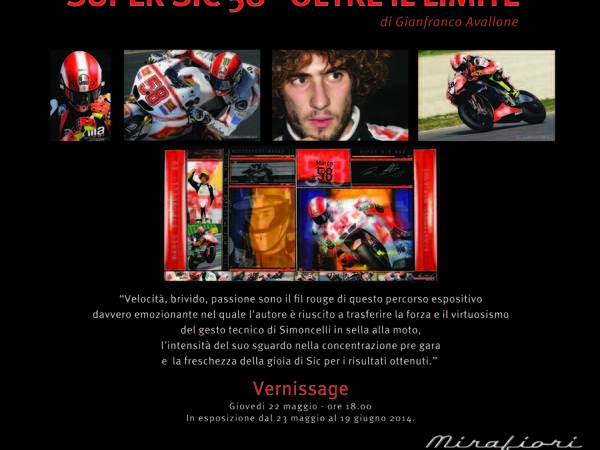 Comunicato Stampa: Super Sic 58, that is Marco Simoncelli. Class 125 European Champion in 2002, World Champion Class 250 in 2008 and from 2010 Honda MotoGP rider in the team Fausto Gresini, to the late champion of Catholic is dedicated to the exhibition "Beyond the Limit" hosted Thursday, May 22 to Sunday 29 June at the spaces of Galerie Mirafiori in Turin. Staged as part of the largest gathering of Jeep ® brand and Harley- Davidson for the first time - Saturday 24 and Sunday May 25 - meet in Turin their own fans in the spaces of the Mirafiori Motor Village, the exhibition is a fascinating image gallery race immortalized by Gianfranco Avallone , professional sports photographer and great lover of engines since 2000 following the racing world in the round. The shots of this anthology , size 100x70 cm , are a selection of the many who Avallone has collected the following rider Marco Simoncelli in the 250 World Championship , MotoGP , at the Monza Rally Show and Superbike. Speed ? ?, thrill , passion is the underlying theme of this exhibition really exciting in which the author was able to transfer the power and virtuosity of technical movements of Simoncelli on the bike , the intensity of his gaze concentration in the pre-race and the freshness of the joy of clubs for the results obtained . To close the gallery also operates the " Super Sic # 58 " made by Avallone and donated to March 3, 2012 Marco Simoncelli Foundation Onlus on the occasion of World Motocross MX FREESTYLE Pala Olimpico in Turin.